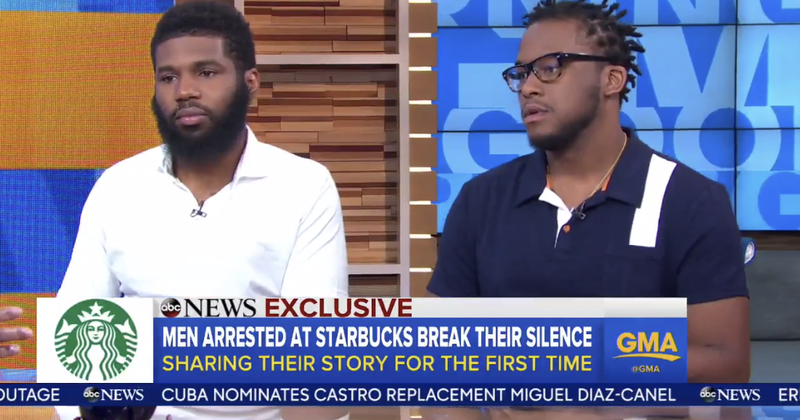 The two men who were arrested for merely existing in a Philadelphia Starbucks are finally speaking out about their ordeal and how it left them in fear for their lives as they were forced to interact with the police over a nonissue. Rashon Nelson told the Associated Press that he originally thought nothing of it when the Starbucks manager told him that he was not allowed to use the restroom because he wasn’t a paying customer. He also shrugged it off when he and his business partner Donte Robinson were approached and asked if they needed help. They informed staff that they were just waiting to have a business meeting. Mere minutes after they had taken their seat, they saw the police walking toward them. “That’s when we knew she called the police on us,” Nelson recalled. The men did not resist arrest but were still confused about how the situation ended like this, what they were meant to do or even what might happen next. The two men have been best friends since the fourth grade. They told Good Morning America that they arrived at the store around 4:35 p.m. for a 4:45 p.m. meeting with local businessman Andrew Yaffe. Call logs show that the Starbucks employee called 911 at 4:37 p.m. Yaffe, who is white, was just arriving as the men were being handcuffed. The businessman is seen on camera demanding to know why the men were being apprehended. Nelson acknowledged wondering if he would be able to make it out of the situation alive. The men spent hours in jail, only being released after midnight because the district attorney refused to prosecute them for trespassing. It was only after the men called to reschedule their meeting with Yaffe that they were told that video footage of their ordeal had gone viral, even as they mulled over what to do in this situation. Since then, the men have met with Starbucks CEO Kevin Johnson to discuss what happened. Both men say they are looking for long-lasting and impactful results, including the posting in stores of a customer bill of rights; the adoption of new policies regarding customer ejections, racial profiling and racial discrimination; and independent investigations of complaints of profiling or discrimination from customers and employees, AP noted. Robinson noted that while he appreciates the public support, there needs to be a different type of action other than anger or boycotting Starbucks. “We need a different type of action ... not words,” he said. “It’s a time to pay attention and understand what’s really going on. We do want a seat at the table.